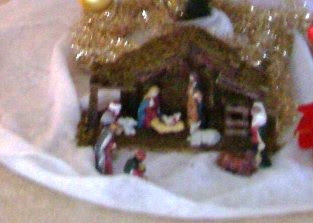 This is the first year I put a Nativity under our tree. The little one was very excited about it when she saw that there are figures shown in the box. I already explained to her what Christmas is really about so she knows what the Nativity is. Lol, at least they're still under your tree. If it was mine, I don't even know if I find it. Your little one made me smile again. Ha ha ha...ang kulet na rin! Hindi kaya gusto lang magpahangin nila mama mary kaya lumabas sila? he he he..
Have a wonderful brand new week! according to height ang line, good job. yes, kids will be kids...kktuwa, buti nakuhanan mo! reminds me of my two boys and of how they love to disarrange anything. well, thats how they are. nice thing is, it never fails to put a smile on our face. have a great week j! ciao! Jul ang cute naman nito. I remember I am always the last if the line is from shortest to tallest. Si Kiko siguro will chew the head off hehehe. We are ok here. Hi! Rocky here. I’m new in the blogging industry and would like to ask for your help in promoting my site www.bibiduck.com through link exchanges :) I will be doing this for a while and rest assured that given an opportunity I will also ask other bloggers to link your site. I know this is a big favor but in the spirit of Christmas I hope you can find the time to do so. Whatever your decision I will be thankful :) Cheers! Merry Christmas!